The November 19, 2017 special events for students of MEA teachers and their families were simply wonderful! Over ninety people took the Guinness Collection ragtime tour. Beginning at noon, there were three sessions of tours, with two groups in each session. Our guides were Michele Marinelli, Curator of the Guinness Collection and Jeremie Ryder, Guinness Collection Conservator. 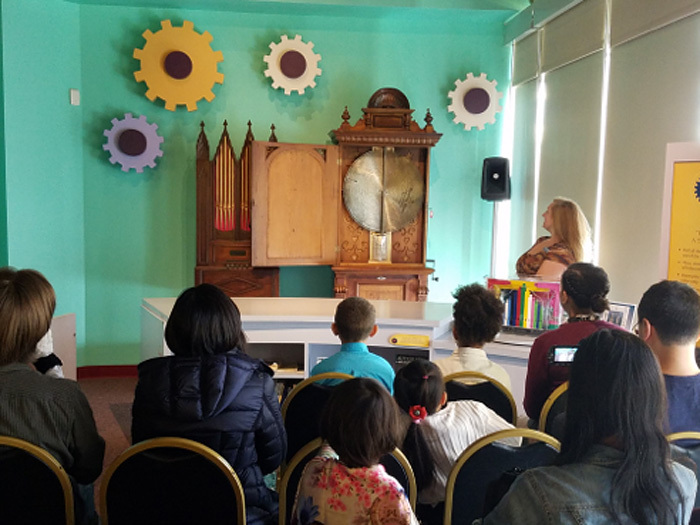 Their enlightening and entertaining presentations focused on ragtime played by old mechanical instruments and by player pianos. The Ragtime Festival, a student showcase of ragtime music, featuring 34 pianists in 28 solo and three duet performances, followed at 3:00 P.M. It was held in the Bickford Theatre in the Morris Museum, the perfect festive and professional performance space for this unique MEA concert. Player pianos were used before electricity became widely used. The piano roll would be hand cranked. The use of foot pedals would create the vacuum required to work the mechanism. The speed of pumping did not change the speed or pitch of the reproduced sound, but a minimum speed was required to create a vacuum. The early phonographs were cranked. Consequently, the turntable speed would vary, changing the pitch or tempo. Artists disliked them not only for those drawbacks, but because people would neglect to change the needle with each playing, damaging the records. With a piano roll system by the popular Amtico, Duo-Art, and Welte Mignon companies, an artist would be assured that his interpretation would be accurately reproduced. Many great artists in the early part of this last century preferred to record on piano rolls. They would record in Aeolian Hall in New York City on a recording piano, and would then edit the roll. Jeremie added that Buffalo, NY, is the home of one of the oldest piano roll factories. Jeremie Ryder in the Dodge Room demonstrating the early 1900 electric player piano. The first piece we heard in the Dodge Room was a metronomic performance of Joseph Lamb’s “Ragtime Nightingale.” Joseph Lamb (1887-1960) was born in Montclair, New Jersey. Then we heard a reproducing piano roll: Bill Flint’s performance of Scott Joplin’s “Maple Leaf Rag,” which was very expressive, full of accents, well placed dynamics, and effective pedaling. 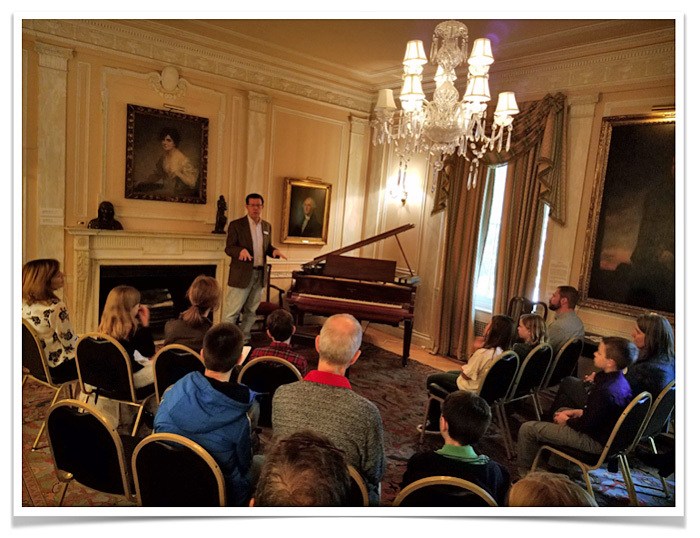 This was followed by another reproducing piano roll: Eubie Blake playing his own “Charleston Rag.” The MEA students in the audience were spellbound. Michele Marinelli, introducing the audience to an early automata cranked disk player. 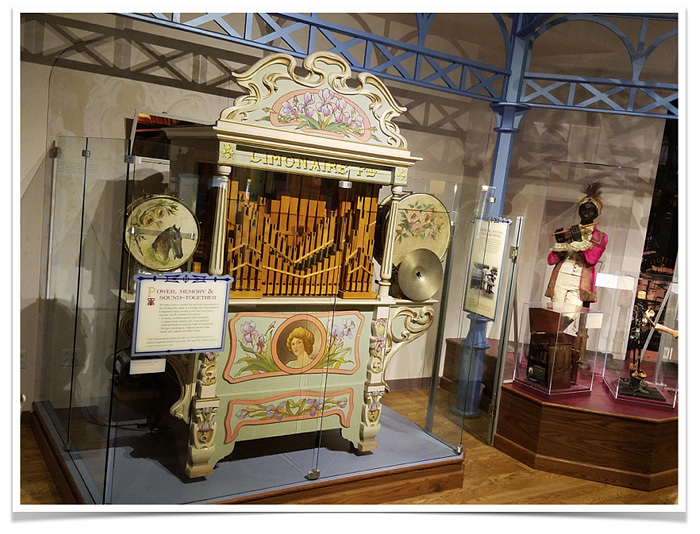 The second part of the tour, offered by Michele Marinelli, introduced us to earlier automata like the disk player and a crank operated fairgrounds organ. 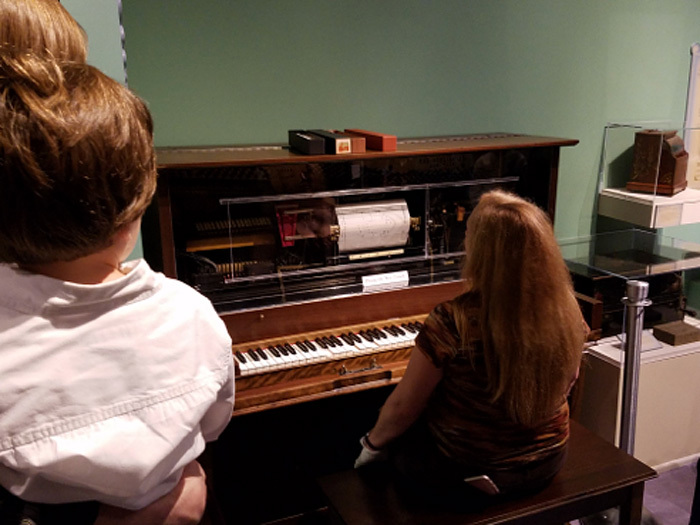 We also watched Michele pumping the pedals on a mechanical player piano in order to play “Grace and Beauty Rag” by James Scott, and “Kitten on the Keys” by Zez Confrey. 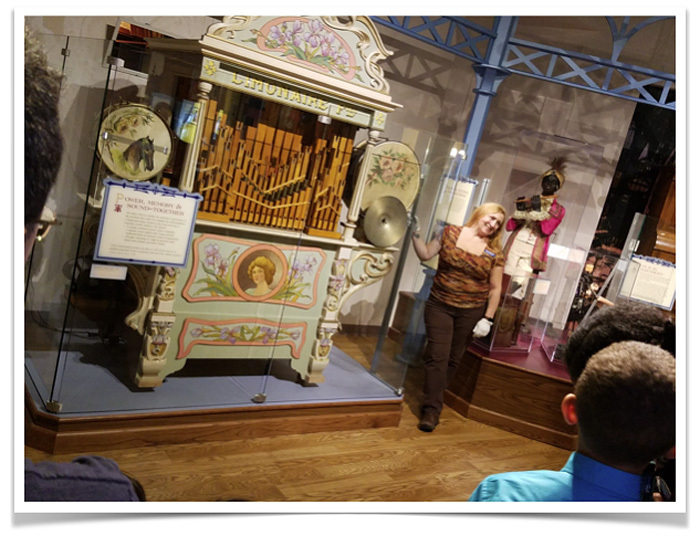 The tour ended with a fairgrounds organ playing Irving Berlin’s “Alexander’s Ragtime Band.” We had seen only a very small part of the huge collection. Michele Marinelli, pumping the pedals on a mechanical player piano. Fairgrounds organ playing Irving Berlin’s “Alexander’s Ragtime Band. After this stimulating tour, we were ready for the Showcase. This was the debut performance of the new sets of piano seat boosters and foot platforms recently purchased by the MEA. Wasn’t this a perfect 90th birthday present for the MEA? Coordinator Ruth Pasquariello had scheduled each participant individually for the tours. Organization was critical. Following check-in at the reception table, each guest would receive one of Nancy’s perfectly designed Ragtime Festival buttons, their pass for the day. Ruth had printed stickers for any last minute arrivals. Charlene Step had designed a beautiful poster featuring the various 90th Anniversary events. The poster was placed on an easel in the lobby, and later put on the concert stage. Ruth printed the program. Lisa Gonzalez and Nancy Modell took photographs. The success of the day was apparent. Students taking the guided tour were captivated. The concert was very enjoyable. The students’ feet were moving and tapping during the Showcase performances. The audience in the Bickford Theatre was attentive and responded with enthusiastic applause. Parents warmly thanked MEA members for this memorable day.